It was only months ago when six-year-old Landen Alexa was racing his bike around the Sooke Bike Park with his friends. Today, he can’t even sit through a day at school without coming home in excruciating pain. At the end of May, Landen was participating in his school’s Jump Rope for Heart fundraiser when he came home complaining of a sore ankle. Landen’s mother, Jillian Lanthier, took him in to Victoria General Hospital where he was given an x-ray and sent home with some Tylenol, believing it was only a sprain. That weekend, Landen was left with his grandparents to heal his ankle, while Lanthier took her other three children away camping. 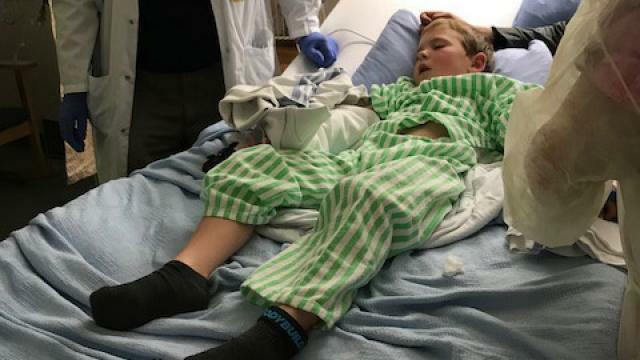 On Sunday, Lanthier received a call from the grandparents saying Landen was very ill and needed to go to the hospital. Lanthier rushed home thinking it was his ankle acting up, only to find her son bedridden with a fever of 103 degrees, and was in so much pain that he couldn’t move any part of his body. When they arrived at the hospital, Landen’s state declined, and his body began to twitch. Nurses told Lathier that something was very wrong and he was admitted to the acute emergency. After 10 days and multiple tests, no doctor could find out what was wrong with Landen. They checked for multiple diseases such as leukemia, lymphoma, and blood infections, but still, nothing. Finally on June 14, Landen was diagnosed with Systemic Juvenile Idiopathic Arthritis (SJIA), a disease that causes his body to attack itself, leaving him with crippling muscle and joint pain and with virtually no immune system. The disease is so severe, even a common head cold can be potentially fatal for him. Landen was given a dose of chemo, and was in and out of the hospital every 18 hours for pain management. Today, he goes to the hospital every two weeks 10 to 14 days for IV treatment, and takes medication daily from home. “Our life is now planned around the hospital schedule. I wish that for nobody, let alone a child, who I feel was robbed by this disease,” said Lanthier. However, his current medicine is no longer working effectively, and the only option for treatment is a drug called Ilarus, which is going to cost Lanthier $19,000 a month, as it is not covered by B.C. Pharmacare. The medicine could greatly improve Landen’s quality of life, helping with pain and allowing him to make a lot less hospital trips. There are only approximately 10 children in B.C. who are battling the same disease as Landen. Jennifer Wilson, executive director at Cassie and Friends, a charity dedicated to helping children with juvenile arthritis, has started a petition hoping to get the B.C. Health Ministry to fund children with SJIA on a case-by-case basis. “We aren’t asking for a blank cheque. There are only 10 kids right now, who won’t have any quality of life and will be an even bigger burden on the health-care system in the long run if they don’t receive the drug,” said Wilson. She explained that the drug is costly because of how rare it is, there is no competition between pharmaceutical companies and it is expensive to test and make. Lanthier has reached out to both Premier John Horgan and Prime Minister Justin Trudeau, and has received responses of sympathy from both. To sign the petition to help convince the Health Ministry to fund cases like Landen’s, visit change.org.